I finally bought a juicer. I’d been resisting for a long time, thinking I wouldn’t be disciplined with it and that it would end up in the cupboard after a few enthusiastic first uses. I’m pleased to say it’s been in the house a good few weeks now and it’s had more than just a few uses already. And, I’m loving it. I’ve been experimenting with ingredients and am not about to start sharing wonderful recipes just yet – my juices so far have been quite plain-tasting – but they’re bursting with veggie goodness and THAT makes me very happy indeed. Typically, I’ve been juicing a whole cucumber, a carrot, a green apple, a handful of spinach and a big chunk of ginger. This produces a juice with a ginger zing but not sweet, and really quite plain. Sometimes I add filtered water or coconut water if I want a bigger batch. It’s no hardship at all for drinking – even my little boy, who’s two and a half, is loving the ‘gween joos’! This week I’m going to try adding some celery and a squeeze of lemon. So what juicer did I buy, and would I recommend it so far? Well, after a lot of deliberation, I bought the BioChef Synergy Slow Juicer from Amazon. It was about €180, which I felt was the most I wanted to spend on a juicer. 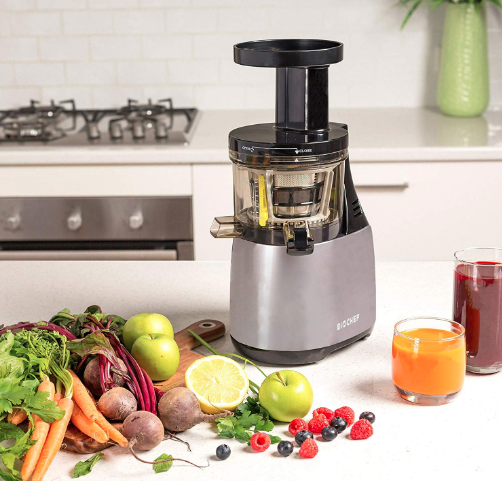 It’s a masticating juicer as opposed to the old centrifugal ones, so the idea is all the nutrients are retained through the juicing process – and this price is very reasonable in the world of masticating juicers, some of which cost up to €600. It’s very quiet – it doesn’t make a lot of noise at all – and it doesn’t take up much room on my kitchen counter. I leave it out all the time – if it’s in the cupboard, I’ll forget it’s there! Once my juice is made, I do the clean up right away. The machine easily dismantles into about 5 pieces which I rinse under running water and set on the sink to drain/dry. I use the supplied cleaning brush to clean the filter piece and it’s all done within about 3 minutes. I’ve been really disciplined so far and washed up immediately to avoid any dried-on green mess which I can only imagine would be a nightmare if you did it a few hours later. The machine struggles a bit with wet spinach leaves – the supplied recipe book says for best results you should wash your spinach in advance and use dry leaves only – I haven’t got around to being this organised just yet. It makes short work of cucumbers, apples, and carrots – I wash and chop them into chunks/long sticks before dropping them down the chute into the juicer. There are also plenty of recipe ideas and helpful tips in the book – it’s a nice extra. So yes, I would recommend it. It’s a good place to start for home juicing and, I think, a pretty reasonable price. I’m making juice now about three times per week and I make enough for two days – so far I’m really pleased with it and my new juicing habit. I’ll let you know when I get some really tasty juices going and will post a recipe or two soon. If you’re thinking about getting started with juicing, The Right (And Wrong) Way to Juice over on the Mind Body Green website is helpful (and includes a few recipes). Fantastic piece Holly, thanks for info. I am looking into buying one myself. I’m definitely going to put one of these on my list to Santa Holly!